February brought global asset classes their first reality check in years that the market can move down at any moment. The big news was around a VIX spike, VIX Futures above 20 for longer than just a day, and VIX ETPs imploding. To learn about that, see our conversation we had with a volatility trader. But what happened in the VIX market seemed to spread into the rest of the markets as every asset class we track recorded down months. What’s that saying about correlations moving to 1? This isn’t surprising that world stocks and U.S. stocks slid together, or even real estate (see our whitepaper on “Truth and Lies in Alternatives Investments.” But Managed Futures have typically zigged while stocks zagged. Thing is – non correlation does not equal negative correlation, and this time Managed Futures performance alongside stocks was all but identical. 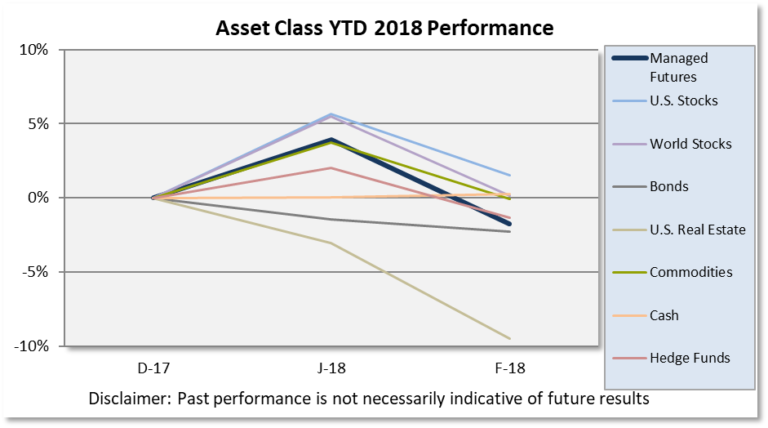 As we mentioned in our 2018 Outlook – some of this down performance alongside stocks may be due to managers dipping their hands in the short vol cookie jar. What will the rest of 2018 look like? Stay tuned. While real estate and private equity may always be linked to stocks in a down move – managed futures are more dynamic and can (and will) pivot to the short side eventually. Exciting times!